Conundrum Coffee can be enjoyed in many different ways. We have outlined some of our favorite brewing methods below and invite you to discover your own unique ways to enjoy Conundrum. The espresso originated in Italy in 1884 by Angelo Moriondo. It remains to be the coffee world's most iconic extraction method and is widely used in making lattes, cappuccinos, macchiatos, and much more. At Conundrum Coffee, we like to put all of our coffees to the test in our espresso machine. We have had great results with a wide variety of single origins, with the best shots coming from well balanced coffees roasted to Full City levels; such as our Natural Process Ethiopian Yirgacheffe and our Classic Espresso. We also have tried some highly acidic single origin coffees but after extraction their taste was just a bit too acidic for espresso. Some of our washed coffees as well seemed to lack enough sweetness to really make that perfect espresso dynamic. Over all, we have yet to meet an espresso that is too sweet. We tend to steer clear of overly dark roasted beans or really light ones in the espresso machine since it will amplify the more extreme qualities of each. We recommend our Natural Process Ethiopian Yirgacheffe for this method. Step 1. Grind coffee to medium-fine and fill basket. Level to brim. Step 5. A balanced espresso should pour 2 ounces in 30 seconds. If you find your espresso is pouring too quickly, your grind setting will need to be adjusted to a finer grind. In contrast, if you find your espresso is pouring too slowly, your grind setting will need to be adjusted to a coarser grind size. Interested in making your own espresso? But don't have an espresso machine? Try the manually operated Aeropress. Although fairly new in its construction in 2005, this little contraption is great for pulling stronger cups of joe at an affordable price. It utilizes pressure exerted by you as a means to extract great bold taste similar to that of an espresso shot. The aeropress is not an espresso alternative, but will yield you a strong brew. This beauty originated in France by Attilio Calimani in 1929. The French Press, also known as the press pot, involves a cylindrical glass carafe and a plunger with an attached reusable wire mesh screen. This is a full immersion method of coffee extraction using hot water creating a full bodied, solid cup of coffee. At Conundrum, we found that more fruity, bright coffees tend lose some of those high notes that make them extra special while we particularly enjoyed the washed processed coffees in the press. We recommend using our Fair Trade Organic Guatemalan Huehuetenango coffee for this method. Step 2. Remove plunger from decanter. Step 3. Measure 42g of whole bean coffee then grind to coarse setting. Step 7. Place plunger on top and push down firmly. This causes the grounds to be pushed to the bottom. The Toddy was invented in Texas in 1964. 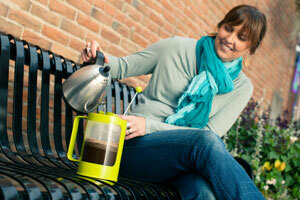 It is a cold brew coffee system that uses time instead of heat to extract the coffee goodness. This cold brew method produces a smoother, less acidic flavor that is good for up to two weeks. The cold brewing process works with any type of coffee or roast level, but we often find ourselves gravitating to either bright African coffees or the earthier, chocolatey Guatemalans. The concentrate is also a great choice for cocktails and culinary applications where you want a surplus of flavor without a lot of extra liquid volume. We recommend using Natural Process Ethiopian Yirgacheffe coffee for this method. Step 1. Using your Toddy maker, take your brewing container and place the rubber stopper in through the outside bottom to prevent grinds from falling through. Step 5. Let steep for 12-24 hours. Step 6. Once time has lapsed, you have your coffee concentrate. Step 7. The concentrate can be added to water, milk, or ice. Or all of the above! 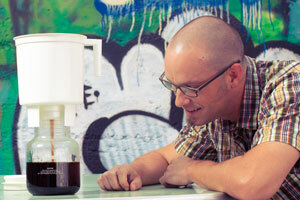 Three parts water to one part concentrate is the rule of thumb for this cold brew system. 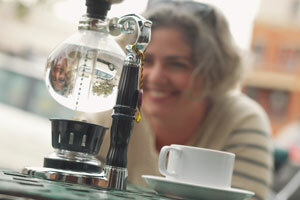 The siphon brewer, also known as a vacuum brewer or "vacpot", is quite possibly the most involved and theatrical way to prepare coffee. The body of the brewer consists of two glass pieces wedded by a rubber O-ring. The filter is a piece of cloth wrapped around a metal disc with a beaded chain dangling from it. The whole assemblage is suspended over a small controlled flame, finishing off that ever-entertaining "mad scientist" aesthetic. Water is added to the bottom chamber, and fresh Conundrum coffee grounds to the top. Placing brewer over the flame causes vapor pressure buildup as the water heats and evaporates. The vapor eventually escapes upward, taking the water with it. The coffee is now brewing. As the bottom container cools, the pressure drops, pulling the brewed coffee back down through the filter and leaving the grounds up top. Cheers! You've earned it! This pour over method orginated in Germany in 1908 by Melitta Bentz. This method achieves a full body taste. It allows the coffee to bloom (de-gas) and to be completely immersed as the water flows through and into the glass decanter. Step 2. Place a (#2) filter into the V60 and rinse with water to remove any paper taste. Step 3. Be sure to discard any excess water that may have filtered down into the glass decanter. Step 4. Add 25 grams of ground coffee to the pre-wet filter. Step 5. Begin to pour boiled water to grounds in a circular motion. Just enough (50 mL of water) to cover grounds and allow them to de-gas. This is called a 'bloom.' The circular motion provides the turbulance which allows for total coverage of the grounds. Step 6. Then add remaining 350 mL of water for final brewing.